This BMW G450RRwill be ridden by top riders - Frenchman David Fretigne and Dutch Frans Verhoeven - and the Portuguese Pedro Bianchi Prata and Paulo Goncalves. The Dutchman in particular has led the development of the new bike rally and remember that Frétigné in 2009 was the first rider to get on the podium with a 450 cc bike. Speedbrain Rallye Kit: speedbrain rallye tank, rallye seat, rear fender, rallye open exhaust, carbon rallye guard with included water tank, rallye fairing incl. alloy stem, head light and wiring loom, front fender. The tank holds 30 Litres, replaces the original reservoir and rear frame, fitting seamlessly below the seat. 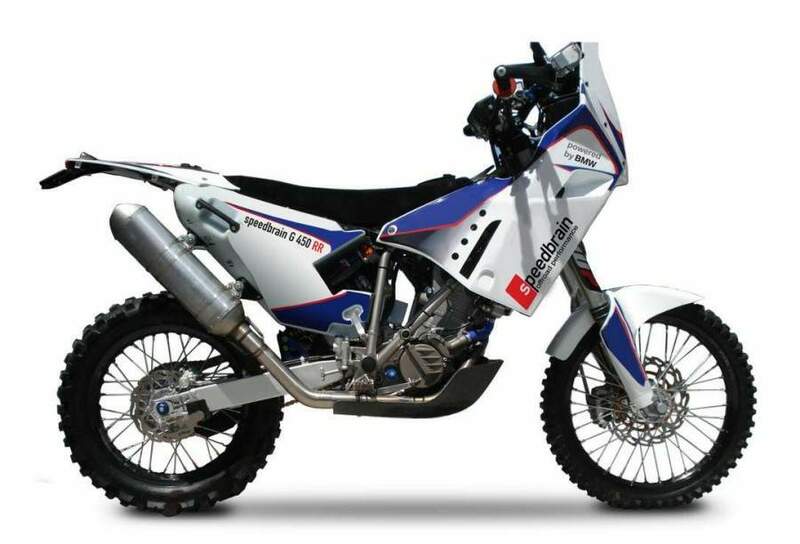 BMW´s 450 X in this way becomes a highly capable rally bike and superb adventure machine, as its range is dramatically extended. The improved tank capacity is sufficient at the Dakar and similar events of the FIM Rallye World Championship. Because of the compact design, the tank accepts even the harshest landings. And because of the well-integrated design, the fuel doesn´t heat up. Rallye professionals know that this often causes problems when the tank is too close to the engine or radiator. Won´t happen with the speedbrain item. The system doesn´t need additional fuel pumps or hoses, either. Another component of the kit is the fairing: a light-weight, robust and good-looking part with an alloy stem. The incorporated materials provide stability at race speed. The stem is laid out to fit head lights, instruments and bear the fairing. A low-rise front fender rounds out the package. The mounting procedure for all parts is easy to conduct! speedbrain rallye activities and the speedbrain rallye kit are a distinctive speedbrain initiative and development and not part of the BMW Factory Motorsport program.